If you haven’t, come out to the Greenway and check out our new work shed made from a recycled shipping container and recycled lumber. It’s not far from the Shelburne Road trailhead. We had a stellar turnout on the greenway on February 18, 2017 to continue our plan to remove and replace invasive plants. About 15 volunteers helped remove tangles of multiflora rose and other plants from an area adjacent to the new storage shed. The removal opened up a small portion of an old stone wall and may help improve the health of a couple of trees weighed down by the invasive plants. This year, the FOHCG will be conducting regular monthly workdays. More dates to be named soon. Thanks to all who helped out and a special thanks to FOHCG trustee Renee Fortner for her work coordinating the workday. Want to help improve the greenway? 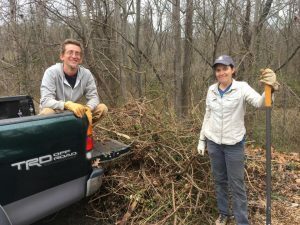 Join us for a workday on Saturday, February 18 from 1:30 – 3:00. We’ll be working on removing invasive species around the new storage shed. Meet at the storage shed. All are welcome. Many thanks to Asheville Bee City USA for holding part of their Pollination Celebration on Hominy Creek Greenway! 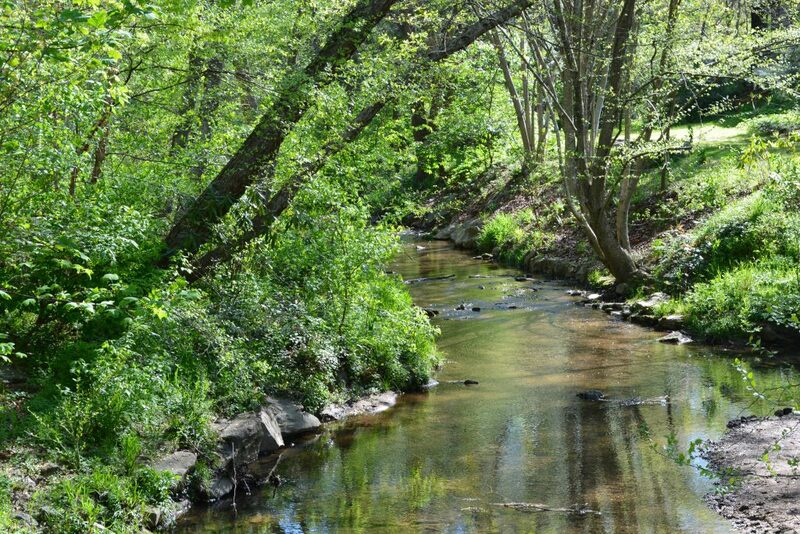 Welcome to the online hub for those who appreciate the Hominy Creek Greenway. The Friends of Hominy Creek Greenway (FOHCG) is a non-profit group committed to the preservation of the Hominy Creek Greenway. We have worked since 2010 with the City of Asheville and local residents in accordance with our mission statement. to connect the HCG to the French Broad River, future greenways, and downtown Asheville. Partnerships that foster support for the greenway and encourage the involvement of local businesses and residents. Well-maintained footpaths to ensure its use as a trail for walkers, bikers, and other wanderers-raising source for the Friends of Hominy Creek Greenway. Join us as a member or volunteer. Please contact board president Jack Igelman at jack@igelman.com if desired. How do I find the Hominy Creek Greenway? The Hominy Creek Greenway is in the heart of “walkable” West Asheville. There are two greenway trailheads that connect Sand Hill Road to Shelburne Road. The trail parallels Hominy Creek and runs through a secluded fourteen-acre tract of forest. There are two public parking areas, one at each end of the greenway. There is a parking area at Sand Hill Road; and a parking area at Shelburne Road near the intersection of Hominy Creek Road near the old National Guard Armory. Each gravel parking area is distinguished by a trailhead kiosk with a map of the trail. Are the Hominy Creek Greenway and Hominy Creek Park the same places? No, they are different parks with similar names. The Hominy Creek Greenway is a city park and the Hominy Creek Park is operated by Buncombe County. Hominy Creek Park is located roughly one mile downstream of Hominy Creek Greenway at the confluence of Hominy Creek and the French Broad River. How long is the greenway? The ⅔ mile linear trail is situated on fourteen acres of public land. The trail is a dirt path that is relatively level. Will the greenway trail ever be paved? A master plan has been developed for the greenway. Currently, there is no timeline to improve the greenway trail. Since the trail is public, it is possible it will be paved to increase accessibility and to be compliant with the Americans with Disabilities Act of 1990. Are there plans to connect the Hominy Creek Greenway with other public greenways? Yes. The greenway will one day be part of a county wide trail system that will be known as the Buncombe Turnpike Trail Network spearhead by the Friends of Connect Buncombe. A feasibility study to connect the greenway to the Bent Creek neighborhood is underway and there are a variety of other community and public greenway projects being developed throughout the county. Is it safe to swim in the creek? You should swim at your own risk. The Hominy Creek watershed drains roughly 80 square miles of the county. The watershed includes industry, roads, and agriculture. The water quality of Hominy Creek is impacted by many dynamic variables that are difficult to detect and not measured on a regular basis. Why are there sewer caps along the greenway? The Metropolitan Sewage District of Buncombe County maintains a sewer line that runs underneath the greenway. Are dogs allowed on the greenway? Dogs are welcome on the greenway. A city ordinance requires that all pets be kept on a leash. Dog owners are encouraged to follow this ordinance in order to respect neighbors, the environment, and other pets and users of the greenway. Who is in charge of the greenway? The fourteen acres that encompass the greenway was purchased in 2011 by the city of Asheville with financial support from Buncombe County and donations from a variety of organizations and private citizens. 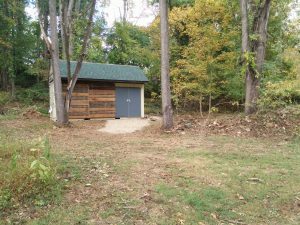 The Friends of Hominy Creek Greenway, Inc. (FOHCG, Inc.) serve as stewards of the HCG. The FOHCG, Inc. is a North Carolina non-profit corporation that is made up of a group of volunteers dedicated to managing the parkland. The FOHCG Inc. has a formal partnership agreement with the city of Asheville. 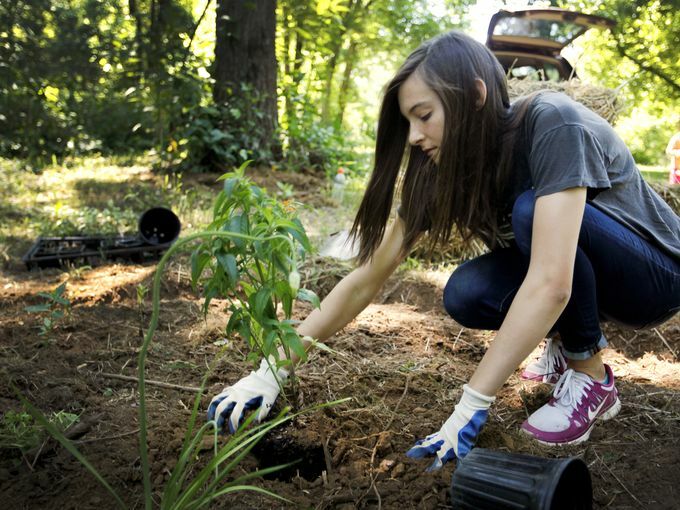 How can I help support the greenway? Please join our effort: become a member, participate in volunteer workdays and/or attend our bi-monthly Board of Trustees meetings. My question has not been answered here. Can I speak to someone instead? Of course. Please contact FOHCG, Inc. Board of Trustees chairman, Jack Igelman, using the email icon on our home page. Quick update on the areas being mechanically cleared. 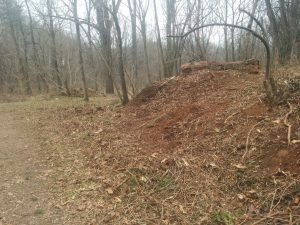 Asheville GreenWorks is currently removing overgrown invasive plants to save our precious trees and create a wonderful place to relax. 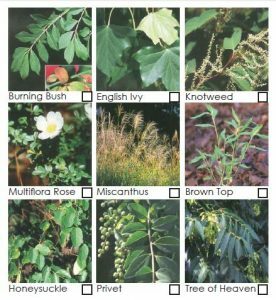 Currently being removed: privet, bittersweet, honeysuckle and the devil himself… multiflora rose. 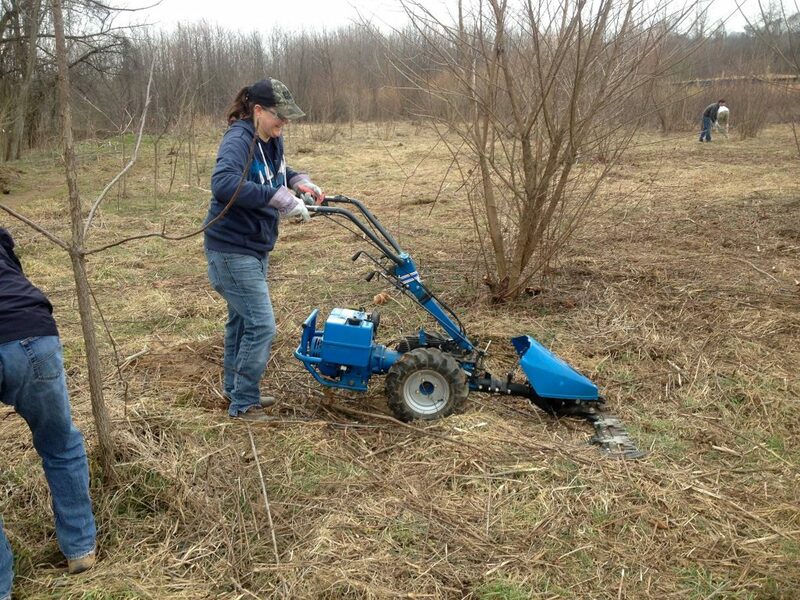 Once these specific plants are removed, we will seed with native grasses and will continue to mow these newly opened areas to beat back the invasive plants. These areas will then become new planting areas for native trees, edible plants and pollinator meadows. Some of these areas will be perfect for beach blankets, picnics, pick-up soccer games, sunbathing, yoga and much-needed relaxation. Public work days will be posted on the kiosks or you can email volunteer@ashevillegreenworks.org if you’re inclined to help out. Volunteers working to expand a greenway for runners, walkers and dogs on leashes are moving forward with work on 14 acres along Hominy Creek. Walk any day along the Hominy Creek Greenway (not to be confused with Hominy Creek River Park) and you’ll pass scores of walkers, nature lovers, runners and families. To me, this represents quite an achievement. For years, West Asheville residents have walked and jogged the narrow path cleared by the Metropolitan Sewerage District between Sand Hill Road and Shelburne Road beside Hominy Creek, but the property only recently entered the public domain.